Have you ever dreamed of getting to Everest in short space of time and with less energy wasted then come book with us for this amazing trekking in Nepal. We take you closer to the Everest in this short trek as well as we take you to the world highest located hotel The Everest View Hotel. The joyous flight from Kathmandu to Lukla with amazing experience of mountain flight. The walking along the trail consisting of the countryside small town of Sherpas would give you idea on how these brave mountain ethnic Sherpa People lives. This five days of trekking in Khumbu region endow the great views of Everest, Ama Dablam, Lhotse, Kongde Ri and Kusum Kanguru. The trek from Lukla to Namche Bazar and the short hiking along the canyon of the Dhudh Koshi are the highlights of the walking in the trail. The hiking to the villages Khunde and Khumjung where most of traditional Sherpa resides would be another exciting activities. The hiking towards the highest located hotel The Everest View Hotel would finally engulf you with the beauty of mountain range as well as the surrounding hills. The majestic Everest seems nearer than ever from the spot. Come and witness the superlative Mount Everest in less strenuous way by booking the Everest Short Trek with the experienced team of Backpacker Treks the travel company in Nepal. Day 02Fly Kathmandu to Lukla & trek to Phakding Early morning Fly to Lukla(2810m.)30min. The Lukla airport often called as Tenzing Hillary Airport is the world’s most dangerous airport. The thrill of landing in such an airport is an added experience to make. From Lukla the Trek begin to Phakding. Phakding is a small village in the Khumbu region of Nepal. It lies in the Dudh Kosi river valley just north of Lukla and south of Monjo, at an altitude of 2,610 m. In this part of the trek we reach to Jorsalle which is the entry point of the Sagarmatha National Park where entry permit will be checked. 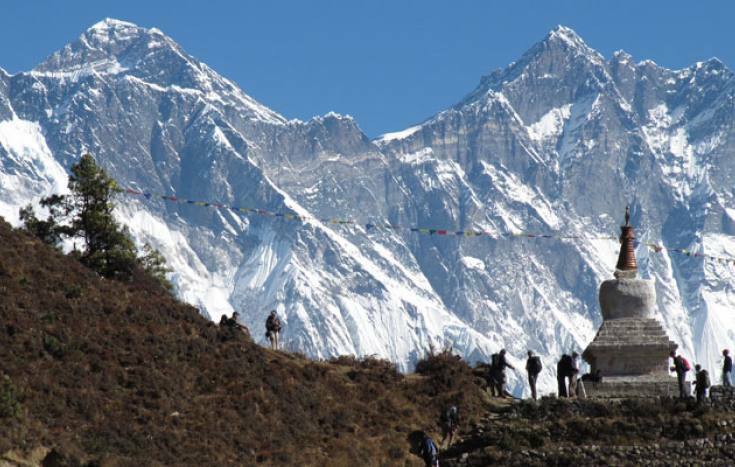 - See more at: http://www.backpackertreks.com/everest-mini-trekking.html#sthash.Xi8oY97x.dpufEarly morning Fly to Lukla(2810m.)30min. The Lukla airport often called as Tenzing Hillary Airport is the world’s most dangerous airport. The thrill of landing in such an airport is an added experience to make. From Lukla the Trek begin to Phakding. Phakding is a small village in the Khumbu region of Nepal. It lies in the Dudh Kosi river valley just north of Lukla and south of Monjo, at an altitude of 2,610 m.
Day 03Trek to Namche Bazaar O/N LodgeIn this part of the trek we reach to Jorsalle which is the entry point of the Sagarmatha National Park where entry permit will be checked. Namche is a village and Village Development Committee (Namche) in Solukhumbu District in the Sagarmatha Zone of north-eastern Nepal. It is located within the Khumbu area at 3,440 metres (11,286 ft) at its low point, populating the sides of a hill. Namche is the main trading center and tourist hub for the Khumbu region with many Nepalese officials, a police check, post and a bank. It is also the place for acclimatizing for the trekkers to go further towards base camp. Day 05Trek Back to Phakding O/N Lodge From Namche, a steep descent of about 1500ft/500m leads through rhododendron forests and fir trees to the Dudh Koshi River. We cross the Dudhkoshi river and we pass the village of Tashinga and Sansa before finally reaching beautiful village of Namche. Upon arrival at this juncture, we can have the gorgeous Ama-dablam, Thamserku, Nuptse, Lhotse and Everest once again. Day 06Trek to Lukla O/N Lodge The last day of trekking. At this juncture we will have fun while trekking with some songs on popular Nepali folk tunes, we will share the pictures that we took and the memories that we cherished. Upon reaching Lukla we will give rest to our mind and body. Day 07Fly from Lukla to Kathmandu O/N HotelWe head back to Kathmandu and as earlier the accommodation will be provided along with the breakfast in a three-star hotel in Kathmandu. On a spare day, you can roam around Thamel or other major touristic areas at Kathmandu and do some shopping. Day 08sightseeing day Half day is sight seen around Kathmandu valley and after lunch free time for shopping and dinner at typical Nepali restaurant with cultural program.